Philips Sonicare HealthyWhite Electric Toothbrush is clinically proven to remove tea, coffee, tobacco and red wine stains, helps to whiten teeth by approx two shades in two weeks with regular use of the Clean and White mode. what a price! good find! 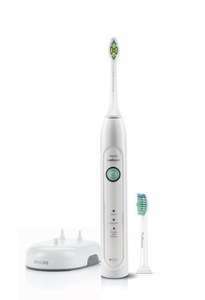 has anyone used both the sonicare and the Braun Oral B models? when reading reviews online some say one is better, some say the other, and i think it depends on which company is behind the research, as its in their interests to promote "their" product..
has anyone used both the sonicare and the Braun Oral B models?Ive been … has anyone used both the sonicare and the Braun Oral B models?Ive been very happy with my Oral B model (which has pressure sensor) but my desntist recommends the Sonicare saying theyre better (with the noise/vibration removing the plaque i believe) rather than oscilating head....but considering there is Philips sonicare adverts around tmy dentists in the waiting room i cant help feeling he's bound to suggest they are better... and i do have another Oral B (cheaper model) that i bought literally for the charger when my original one wouldnt charge any longer... so i have that spare.. but this Sonicare looks like one of their top spec models with the teeth whitening...when reading reviews online some say one is better, some say the other, and i think it depends on which company is behind the research, as its in their interests to promote "their" product.. I did find an independent (as far as I could tell) report comparing the ultrasonic and rotatory methods used and the ultrasonic (Sonicare) did come out best. I cant find the report now of course. However I have tried both and hands down the sonicare is best (I just have the cheapest one), it leaves your teeth feeling much cleaner than the Oral B. My wife didnt like the feeling of the sonicare and eventually went back to the oral B. Very quickly she realised the Sonicare was doing a better job and started using that again. This comparison tells you all you need to now about the different models, but the short of it is all the different modes are pointless unless you absolutely need a soft brushing mode. I've had both in the past and I currently have the Oral B purely down to price. Sonicare does indeed leave your mouth feeling cleaner and teeth smoother. If you buy this from John Lewis, it's £42.95 including delivery or £39.95 free click and collect; plus John Lewis give you 2 year guarantee. Deal posting newbie! This is doggydogg first deal post. Help out by leaving a posting tip or just to show your appreciation for their contribution.